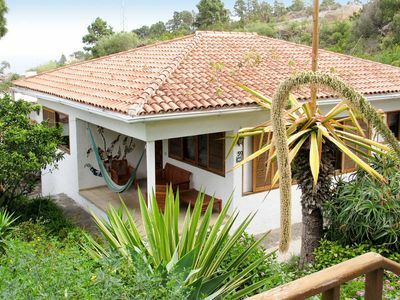 Located less than 100 metres from the beautiful and picturesque beach of Cala Deia on the north of the island, this traditional villa boasts a fantastic location especially suited to beach-lovers. One of the loveliest beaches in the area, Cala Deia is clean and safe, with white sands and sparkling waters.. Deia itself is a charming and quintessential Mallorquin village, popular with artists, writers and poets who have been drawn here over the years by slower pace of life and stunning backdrop of the Tramuntana mountain range. The nearby restaurant of Cas Patro March is a must-visit for foodies – frequented by locals, visitors and celebrities alike, it serves up some of the best local dishes on the island. Just 19 miles from the capital Palma de Mallorca, and within easy reach of the airport, Deia offers a peaceful yet vibrant respite for those looking to really kick back and relax during their time on the island. The house itself is bright and spacious, and has been built in the typical Mallorquin style, with a stone exterior, exposed wooden beams and flagstone flooring throughout. The ground floor is given over to the open-plan living space that incorporates a comfortable sitting room and elegant dining area, both of which give access to the outdoor terrace via classic French windows. The kitchen is spacious and practical, and comes fully equipped with everything guests may need during their stay. Each of the bedrooms is in keeping with the rest of the house and has been decorated in a discrete, classic style. The master bedroom is particularly impressive, with a large walk-in wardrobe and en-suite bathroom with Jacuzzi bath. The remaining two bedrooms both have twin beds, ample storage space and share the second bathroom. The exterior of the property is just as beautiful as the interior, with a large salt-water swimming pool, shaded terraces and dining area, and large outdoor barbeque and kitchen- perfect for preparing all those al-fresco meals in the warmer months. 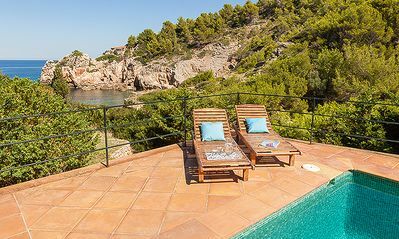 Guests can be on the beach in seconds thanks to a private path that leads directly from the house down to Cala Deia, a real highlight of the property. 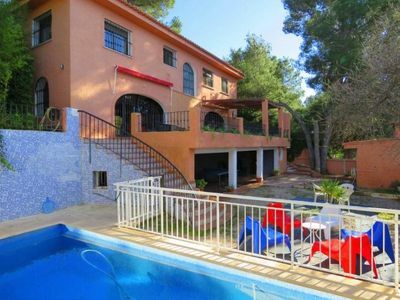 With its fabulous beach-side location and beautiful traditional interior, this elegant house is a great option for those looking to enjoy the sun and the sea during their time in Mallorca. Due to our constant efforts on mantaining our high standards, some pieces of furniture or decoration may be different from the ones shown in the photo gallery. Ground 2000m2. House 220m2 on two levels: Entrance leads into hall and the living room/dining area with table and chairs to seat 6 people. The living area has two three-seater sofas with a wooden coffee table in the center and an open fireplace on one side, flat screen 42" Satellite TV on a separate furniture with DVD and an easy chair in one corner. The exterior terrace is accessed from the living room and dining area. 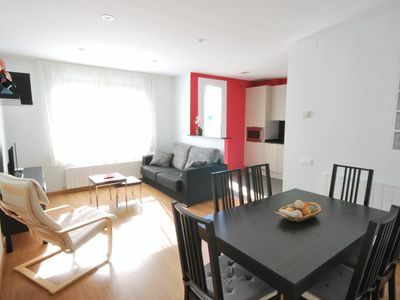 On this level there is a fully equipped kitchen with ceramic hob, oven, fridge freezer and microwave. Separate laundry room with washing machine. Level 2: All three bedrooms are on this level. Master bedroom with king sized bed (1.80m x 2.00m) has an en suite bathroom with a Jacuzzi jet in the bathtub and walk in closet. Bedroom 2 has a twin bed (1.60m x 2.00m) and bedroom 3 has twin beds (0.90m x 1.90m). Both bedrooms have fitted cupboards and share a bathroom with shower. 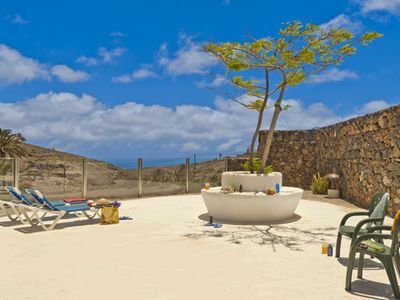 All three bedrooms have access to the top terrace. Grounds: 50m2 swimming pool with salt water. Large terrace equipped with sun beds, 2 separate areas with tables and chairs for al fresco dining and barbeque area. The house has direct access to the beach.